As noted last month, several initiatives are underway to enhance sales and values. The initiatives, sponsored by the ArrowCreek Homeowners Association (ACHOA), include a Landscape Committee, which is looking into improving the water quality around our parkway to enhance the ‘greening’ of plantings, a strategic planning initiative, which has yielded a preliminary concept that has received rave reviews from those who’ve seen it, and an update of the Governing Documents, drafts of which have been issued for owner comments and questions. These initiatives are intended to enhance and maintain ArrowCreek as a premier people and family oriented community. 1. ArrowCreek properties have stayed in the premium class within Washoe and Douglas Counties. As you read this report you will see that prices have improved for properties on the golf course, with an average appreciation rate of 8.9% over this past year, while prices for homes not on the golf course have also trended upward with an increase of 6.7% over the same period, with the ‘hottest’ neighborhood being Granite Point I. Given round-off factors, these values are right in line with Reno-Sparks price increases as reported by the Reno Gazette Journal on Sunday, 25 June 2017. a.) Ten (10) properties were recorded sold in ArrowCreek between 8 May and 9 June 2017 (Per the Washoe County Assessor, who appears to be running late as the data was extracted on 23 June and the last ‘sale’ recorded was 9 June). This brings the total number of properties transferred over the past year to 86 or 7.9% turn-over rate for our community. A relatively low rate, still in the single digits, that may be attributed to a general satisfaction with living in our gated community or a positive perspective on our amenities and an emphasis on the secure stable environment offered within ArrowCreek. b.) Two (2) of the properties were on the golf course (where the property boundaries actually touch the golf course, not just have a ‘view’ of it). The rolling average selling price for homes on the golf course now stands at $258.52 per square foot. An increase of $3.89 per square foot from May’s value. The 12-month rolling average sales price increased to $965,231.52. No additional lots, on the course, were sold. The rolling average selling price for undeveloped property on the golf course rose to $320,429.03 per acre due to the statistical rolling year average. c.) Eight (8) properties were sold that are not connected to the golf course. The rolling average selling price for off course homes decreased to $245.61 per square foot, which is down by 87 cents per square foot (in spite of a semi-custom home selling for a million dollars last month, a first). The twelve-month rolling average sales price increased to $798,928.92. Two lots were sold during this reporting period. The rolling 12-month average selling price for vacant land, not on the golf course, now stands at $201,991.30 per acre, an increase of $19,977.80 per acre. d.) A premium price exists if the vacant property has a common boundary with the golf course (58.6%, down by a point from last month but not a significant amount). This difference in values between the two categories of vacant land continues to be difficult to explain. There are fewer lots on the golf course but the eventual home prices do not appear to reflect this increased cost factor. This month’s difference in average costs amounts to $118,437 per acre. e.) The figure below shows the value trends over the past twelve months. Our homes and properties have appreciated very nicely over this past year and hopefully that trend will continue throughout 2017. 2. The housing market in Northern Nevada for existing homes continues to follow economic trends. The spring selling season is definitely upon us and we are seeing a boost to our unique community. Do keep in mind that everyone’s selling price is based upon their own set of circumstances and the above picture is hindsight, not necessarily foresight. Going forward let’s focus our energy on improving the amenities we currently have and build out those that were in the original ArrowCreek/Southwest Point development plan, by using our already available acreage and funding. With that we should see a better environment for all home owners and buyers. If you wish to support The Club at ArrowCreek, you are definitely urged to become either a full golf or social member. In addition, the FOA LLC is certainly open to new investors. 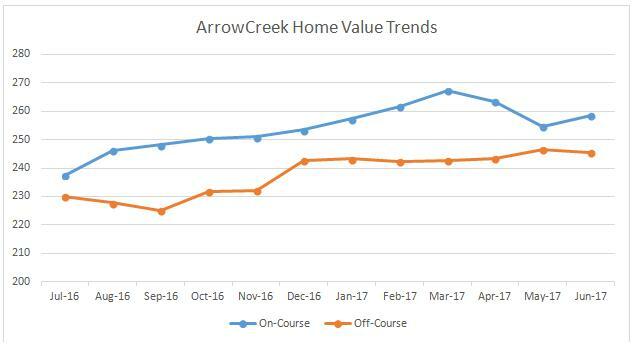 For previous postings of the ArrowCreek property value updates: click here. This entry was posted in ArrowCreek, ArrowCreek 411, ArrowCreek411, Home Sales, Home Values, Land Re-Use, Land Use, Land Value Study, Property Value, Real Estate Value, Truth and tagged ACHOA, ArrowCreek, ArrowCreek 411, ArrowCreek home values, ArrowCreek411, Golf, Golf Course, HOA, Home Sales, Home Values, Homeowner Association, Homeowners Association, Land Re-Use, Land Use, land value, land value study, property value, Truth, Washoe County Assessor Records. Bookmark the permalink.